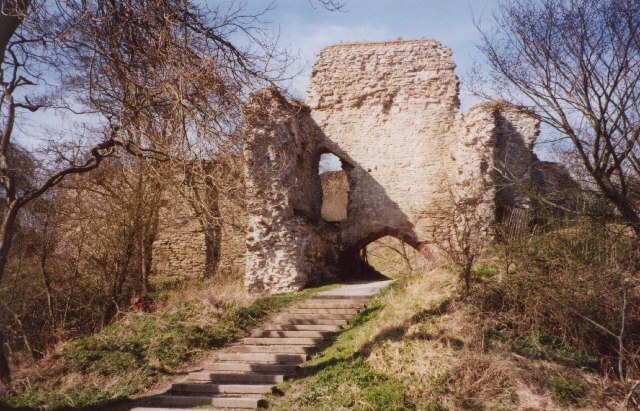 Notes: Wigmore Castle is a ruined castle which is barely visible from the village of Wigmore in the northwest region of Herefordshire, England. The castle is of great strategic importance as it lies almost halfway between the rivers Teme and Lugg (about 4 km from each) and commands the wide area between them. Wigmore Castle itself straddles the south-eastern edge of a spur, with marshland (since drained) to its north. The defences of the castle were further strengthened by the construction of ditches across the spur, between which the castle was built. These ditches acted as moats with the north-western one running past a mound, which was also fortified. This fortification was originally probably a wooden palisade, but later a stone keep was constructed in its place.